David is a social media star, a vlogger with a million subscribers and six hundred thousand followers. With a pretty face, inoffensive views and constant sunny, silly updates, David is the epitome of modern celebrity. But is it enough? How long can he stay on top? How long will his fame last? When the technological genius that is Xan Brinkley wants to meet David to discuss his latest project, MindCast, David’s agent has him there straightaway. But what is MindCast and how does it threaten vlogging? MindCast is exactly that, a visual and auditory projection on screen of what a person is thinking. With just a small operation to insert a chip into the base of a subject’s neck, their entire reality can be viewed almost instantaneously. What could possibly go wrong? Without spoiling the plot, Broadcast explores exactly what could go wrong with this kind of invasive technology. Can you be free if your thoughts are no longer private, no longer your own, but broadcast to the world in an unending stream? The idea behind Broadcast is compelling. Combined with clear and precise language as well as sharp dialogue, the novel really gets a hold of the reader, forcing you to put aside other daily tasks until it’s finished. Fun and scary, Broadcast is a page-turner with a very dark heart. 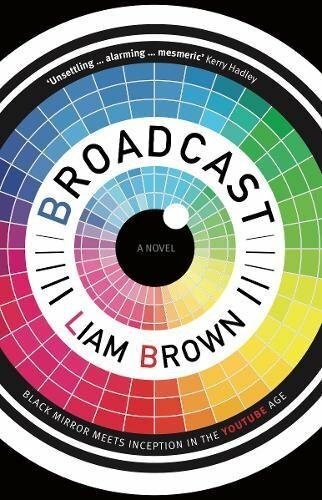 Portend or not, Broadcast is one of those science fiction novels whose near future reveals problems modern readers ought not to ignore. I’m currently reading Small Hours by Jennifer Kitses and will be reviewing it later this week.